B-PESA, Tanzania’s first prepaid card will see its operating territory increase after partnering with Chinese bankcard association UnionPay. 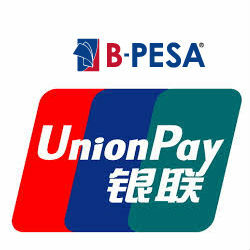 Introduced by Smart Banking Solutions, B-PESA card’s new deal with Shanghai based UnionPay will dramatically increase the cards access to markets outside of Tanzania. The agreement will expand B-PESA’s operating territory to include 142 countries with 1.6million ATMs and over 12 million merchants. UnionPay Chief Representative for Africa, Li Zhixian, emphasized the compatibility of the two payment service providers and suggested that B-PESA would have significant implications for the payment industry in Tanzania. In recent years Tanzania has welcomed increasing numbers of Chinese enterprises and tourists. Earlier this year UnionPay also announced a partnership with Tanzania’s largest commercial bank CRDB ensuring that all the banks ATM’s and POS Terminals would accept UnionPay cards, enabling Tanzanian businesses to more easily accept payments from Chinese visitors. According the CIA, China currently stands at Tanzania’s primary trade partner for imports accounting for 21.3% of all imports and second largest trade partner for exports with an 11.1% share.